A Chicago-style hot dog is a steamed, boiled or grilled all-beef hot dog on a poppy seed bun, originating from the city of Chicago, Illinois. The hot dog is topped with mustard, onion, sweet pickle relish (often a dyed neon green variety called "Nuclear Relish"), a dill pickle spear, tomato slices or wedges, pickled sport peppers, celery salt, and cucumber slices, although ketchup is not commercially used on a Chicago-style hot dog. The complete assembly of a Chicago hotdog is said to be "dragged through the garden" because of the unique combination of condiments. 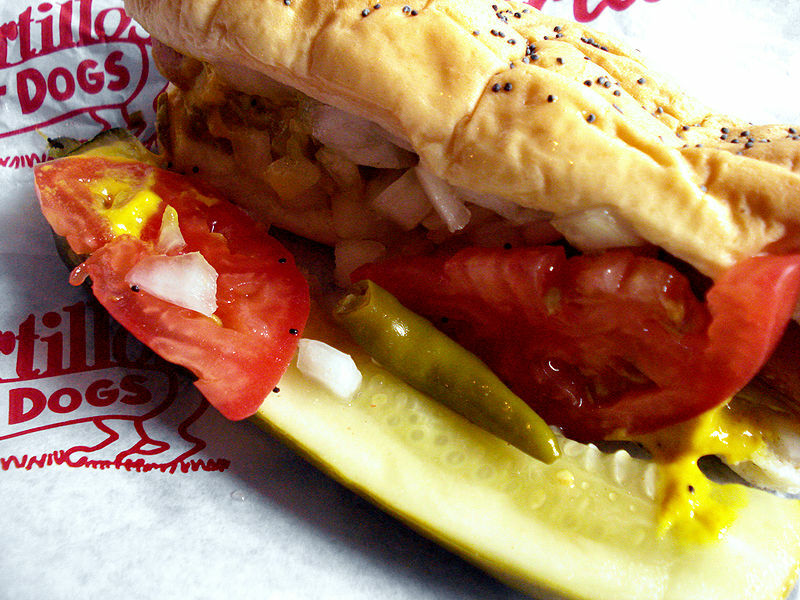 Chicago-style hot dogs are cooked in hot water or steamed before adding the toppings. Less commonly, they're grilled and referred to as "chardogs." The typical hot dog weighs 1/8 of a pound and the most traditional type features a natural casing, providing a distinctive "snap" when bitten.